American Advertising and Research Corp. I can't imagine even the most hardened and serious camera collector walking away from this great little gem. Well, at least I didn't. 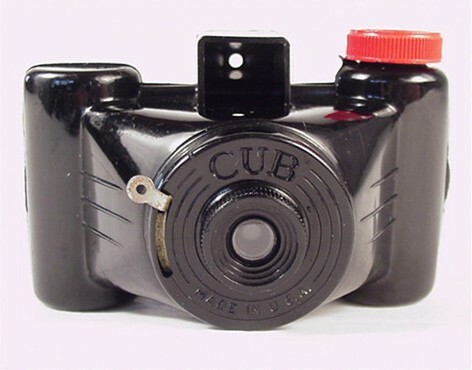 The Cub was created by the American Advertising and Research Corporation (the name is bigger than the camera!) of Chicago, Illinois USA and sold in 1940 as a Pepsodent dental products advertising premium. The price of the camera was one Pepsodent box and 15 cents. Good deal. The camera even has a lens. And to this day, the shutter still works, though I haven't checked it for accuracy. 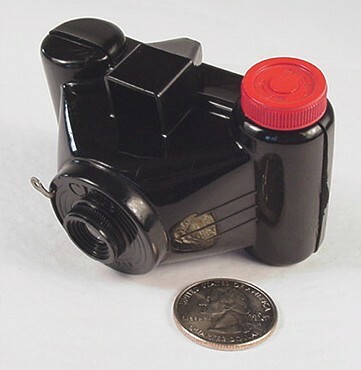 The Cub takes size 828 film and creates a 28 by 40 mm image. This tiny camera makes an image larger than a full-frame 35mm camera... so trade-in that Leica. There is a red window in back for counting exposures. No complicated electro-mechanical stuff to get out of whack. Here is a link to a great advertisement for the Cub camera and Pepsodent products.